Artist unknown. From the story “The Witch from Wichita” in CRIMES BY WOMEN #10, 1949. Crimes by Women and The Witch from Wichita…. Jeez, John, you’ve got to republish that story! 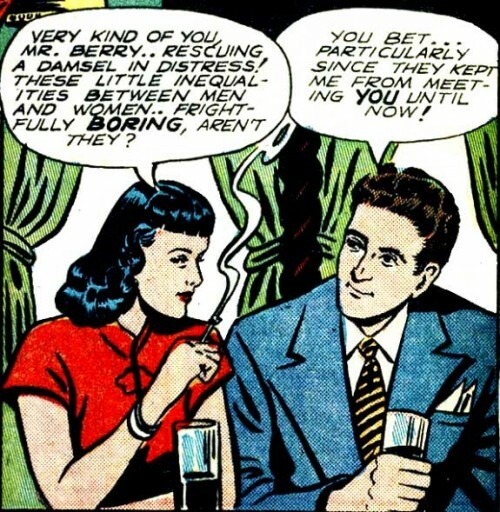 And those boring inequalities, and possibly also boring differences, is why she’s a lesbian. Too boring to be hetero. She looks more feminine here than the art in GoComics. He she is luring him into her wicked web of crime. In the updated version, he’s already got the green light after buying her a few drinks. Standards have slipped these days, I fear. Back in 1949 you had to do more than just buy a few drinks, like wear a suit and tie!